New HIV Quant Dx kit CE-mark obtained! Sacace has obtained CE-mark certificate for its new HIV Real-TM Quant Dx lyophilized Real Time PCR kit. Download the certificate here. Dengue Real-TM Genotype is a new kit from Sacace able to detect and differentiate Dengue Virus RNA type 1-2-3-4. HCV RNA and HBV DNA kits CE-IVD mark obtained! 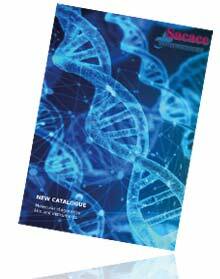 Sacace has obtained CE-IVD mark certificate for its new HCV RNA and HBV DNA lyophilized Real Time PCR quantitative kits. Download the certificate here. HLA B27 Real-TM is a new Real Time PCR kit for detection of HLA B27 polymorphism. It is now possible to download the new 2012 catalogue from our website clicking on the image on the right.